The word is "under sound", meaning what? The basis for this work rests in the mind of my friend John Heward. 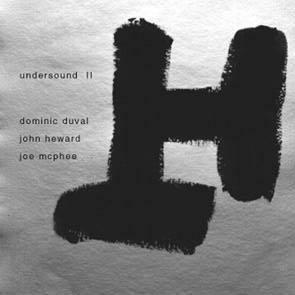 A reading of John's hieroglyphics, some of which you can find on the cover of "undersound" I & II. All these words refer to the beginning and the end of a journey in time, not in domain. Where we are now as people on this, the third planet from the sun, is for now considering the means of current transportation fixed. The only vehicle left to speak of is time itself, which for most of us stands fixed in the total scheme of life endeavours. "Th" is the birth and death of a breath, we are reaching out to "TH" of future.